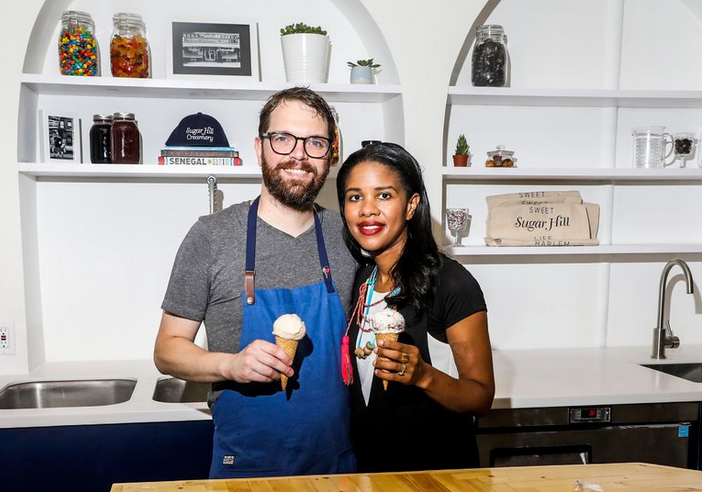 Nick Larsen and Petrushka Bazin Larsen — Harlem EatUp! Sugar Hill Creamery was an idea brought upon by the ‘sweet life’ that so many generations in Sugar Hill Sought. As Harlem residents for close to 15 years, we dreamt of this ‘sweet life’ when we lived in Sugar Hill on St. Nicholas Ave & 148th street. Located in the Mt. Morris Park District of Harlem, our current neighborhood, the shop is a love affair between community and food – something all our neighbors can share and take part. Dedicated to local collaborations and the best ingredients, we offer handmade dairy and nondairy ice creams and treats like floats, ice cream sandwiches, push pops, and sundaes throughout the year.